Currently Shner plays with her jazz quartet in Eugene and Portland, Oregon. Her latest project involves nursery rhymes and ancient melodies from the Jewish liturgy performed in a jazz setting. In September 2008, her first jazz CD, titled TUESDAY’S BLUES, was released on OA2 Records. TUESDAY’S BLUES got great reviews from JazzTimes, All Music Guide, and Jazz Review. Jazz festival performances include the Diet Coke Woman in Jazz Festival (NY), Bellayre Festival (NY), and New-Trier Jazz Festival (IL). Idit appears on Music from SEAMUS Vol. 16, a compilation CD of music for instruments and electronic sounds by members of the Society for Electroacoustic Music in the United States. As a classical saxophonist Idit has commissioned and recorded new music and performed solo recitals in the US and Israel. Her third CD, Le Merle Noir, featuring music by Messiaen, Bozza, Partos, and Glass, was released on Origin Classics in August 2013. Her previous classical recording, FISSURES: 20th Century Music for saxophone and Harp with renowned harpist Yumiko Schlaffer, received great acclaim and was played on NPR’s All Things Considered. Idit has collaborated with Fireworks, Beta Collide and Third Angle (new music ensembles), and performed with the Oregon Symphony and the Eugene Symphony. Other appearances include the Northwest Percussion Festival, Electronic Music Midwest, the Oregon Bach Festival, and many North American Saxophone Alliance Conventions. During March 2006 she played in Israel as a featured soloist with a symphonic orchestra, and performed contemporary music at the national convention of the Society for Electro Acoustic Music in the US. Her last solo recital in Israel was broadcasted live on Voice of Music, a national public radio station. During 2005-2006 Idit frequently played lead alto with Sherrie Maricle and the DIVA Jazz Orchestra. Performing her own compositions in a jazz combo setting, she was selected to participate in Betty Carter’s Jazz Ahead. Idit holds a Bachelor of Music degree from Oklahoma City University, a Masters degree in Music Education from University of Central Oklahoma, and a Doctor of Musical Arts degree from University of North Texas. Idit now teaches at the University of Oregon, as associate professor of saxophone and jazz studies. 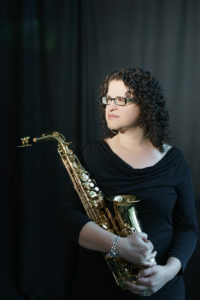 She was recently awarded two prestigious teaching awards: The 2015 Thomas F. Herman Award for Excellent in Pedagogy in areas of saxophone technique and chamber music coaching; and the 2016 University of Oregon Faculty Excellence Award.